Carrying your baby around the airport can be incredibly stressful, for both you and them. Not only will you get tired sooner, but chances are that your little one is going to get anxious and nobody wants that. That is why you should bring a stroller to the airport, but not any kind. A good, portable travel stroller. What’s the difference? 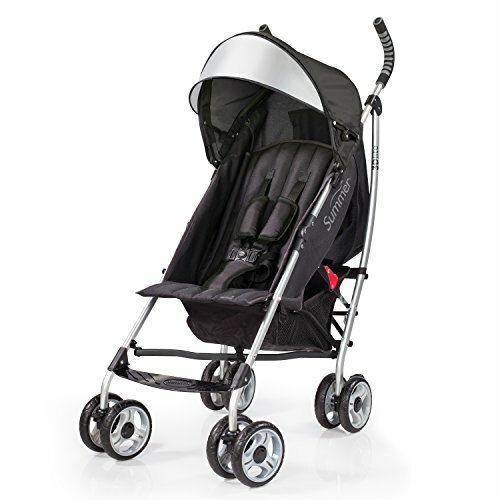 Jogging strollers are usually packed with features and storage space, and they can get really bulky and heavy. Because of that, airport security will not allow you to check them – you can only check travel strollers. I’ll talk a little bit more about the details later. For now, all you need to know is that I’m going to find you the best travel strollers money can buy. Some will be pretty affordable, and others won’t be as cheap, but there will be something for everyone’s budget. So, if you want to travel worry-free with your little one this summer, enjoy this review. What Are The Best Travel Strollers For You? A travel stroller is a lightweight, collapsible stroller that was designed to be portable. The best ones weight less than 20lbs - anything heavier and most airlines will not allow you to check it at the gate. That would mean that you won't get it back before baggage claim, which would certainly be inconvenient if you happen to have a long layover. You need a travel stroller because it will make flying with your baby much easier. For one thing, you can check a lightweight portable stroller at the gate, which means you get it back as soon as you deplane. That is particularly beneficial for parents who have a very young baby, or who have to switch planes and spend another couple hours at the airport. And the same goes for driving, or travelling via bus or train. Also, do you really think it will be fun to drag around your fancy jogging stroller while you are on vacation? Of course not! It might be so good and have all the accessories you need, but it's not really travel-compatible. If you check your stroller at the ticket counter, you will get it with the rest of your checked baggage. If you don't think that you will need it before, then you can check it there. But keep in mind that it will be treated just like all your other luggage. Remember those scuffs your brand new Samsonite suffered the last time you checked it? Just imagine what the stroller will look like. So, be sure to remove all accessories from it, and particularly anything that dangles. It won't be treated gently, and chances are that it could break, or some things could come apart form it and you wouldn't see them again. If you check your stroller at the gate, then you should get it back as soon as you get off your plane. That would certainly help transporting your child through customs and immigration, and even more so if you have to get on another flight. But keep in mind that you can only check collapsible strollers up to 20 lbs at the gate. Heavy and non-collapsible ones must be checked at the ticket counter. Always take your time to weigh your options and figure out which of these suits you best. ...is something US airlines will not let you do. However, some European airlines allow that you bring your (travel) stroller inside the cabin, depending on how much space they have left in the plane. And naturally, depending on the size of the stroller - they won't let you carry it on if it can't fit in the overhead compartment. Travel strollers come in many different sizes, and you always need to make sure that the one you buy will fit your child. Some are designed for newborns, while other can fit children that are up to 50lbs. Definitely check for this information - I will put it in the Product Info box at the bottom of each section, so it should be easy to find. But none of them are for twins, so if you need that, check out this post here. One more thing - the smaller the stroller the better. It will be easier to transport from one place to another, it will be easier to carry around the town or the beach, and it's just easier to travel with. Definitely try to pick the smallest one, but that can still fit your baby. Just like everything else, travel strollers come with different price tag. You will find some really affordable ones, but also some that probably more expensive than your suitcase. Define your budget - if you can't afford to spend $100 on a travel stroller, then don't. I will find you something cheaper, so you don't have to splurge. But I will also find some more expensive ones, for the luxury lovers. The Baby Trend Rocket stroller is great for travelling because it's very lightweight it takes up very little space when folded. 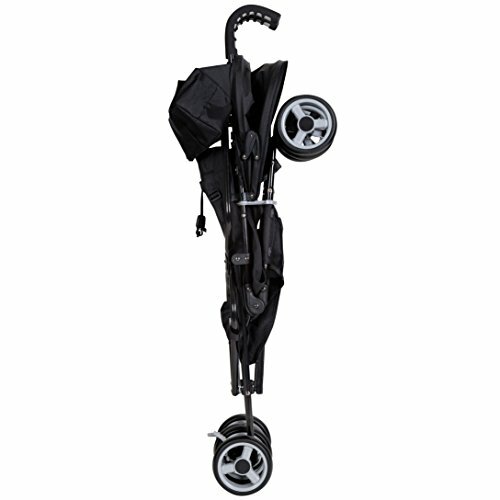 This is also an umbrella stroller, since it does fold up just like an umbrella. This particular travel stroller features a reclining seat, but it can only recline 4-6 inches. So, it might not be the best one for nap time, but it will do just fine for transport from point A to point B. It also features a large shade canopy, which will protect your child from the sun. And there is a large basket underneath the seat for any on the go necessities for the little one. But there is also a spot for you to put all your things - the parent organizer, which has two cup holders and a pocket just large enough to fit your phone or wallet. 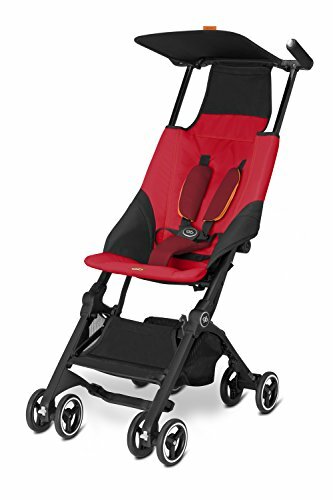 Other good features of this stroller include a 5-point harness designed to keep your child safe at all times. And for you, there are the comfort grip handles that make it easier to push around. The shade of the stroller is good for small babies, but it won't do much for larger toddlers. It is pretty small, and keep in mind that your child could grow it out very quickly. The reclining feature could be much better, as 4-6 inches really isn't a lot. Your child will be sitting straight up most of the time, which certainly won't be helpful when it's nap time. The ZOE XL1 stroller is a great purchase, but it's definitely not for everyone's budget. It is incredibly lightweight - with only 9lbs, it might just weigh less than the child in it! Just look at the size of that canopy. It will do a great job at protecting your baby from the sun, regardless of the angle it's coming from. And it's adjustable - you can fold it and extended as much as you need. The seat of the Zoe travel stroller can recline up to 135 degrees (90 is upright, and 180 is flat). So, it is very adjustable and it will work perfectly for getting your baby to lie back when it's time to sleep. 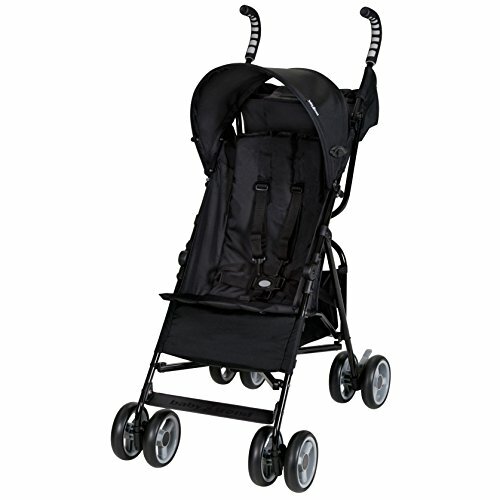 You will also get plenty of accessories and storage space with this stroller. The basket below the seat is pretty large, and there is also a rear canopy storage pocket. The stroller also comes with a cup holder for both you and the baby, and a snack cup for them. I wouldn't say that any of the features on this stroller are bad - you get what you pay for. The only thing that would make it better is a lower price tag, so that more people could afford to get it! What's so special about this stroller? Well, just look at the second photo. That's how the Pockit looks like when completely folded - it can literally fit in your purse, and without a doubt in your carry on. You wouldn't even have to check it, and it would certainly make travelling with the little one so much easier. This stroller is packed with features, so let's get straight into them. There is a storage basket below the seat, and it can hold up to 11 lbs, which is just enough for an extra blanket or a bottle. The wheels can be locked and unlocked. When unlocked, they can turn 360 degrees each, which means excellent maneuvrability. When you lock them, you will have more stability on uneven surfaces, since they won't be able to rotate. The harness is fully adjustable, and it features a 5 point safety system, along with shoulder and crotch pads for the comfort of your little one. Well, the canopy is pretty small and practically non-existent. It won't really protect your child from the sun, and so the manufacturer wants you to purchase an additional, larger shade that you attach to this stroller. But there are some good news - you can get a much larger shade for less than $15. I'd say that it's worth it, but that is up to you to decide. The seat doesn't recline at all. However, most moms didn't encounter this to be an issue since their children could comfortably sleep in this stroller. Closed Dimensions: 12" x 7" 14"
The Summer Infant 3Dlite stroller is one of the most popular ones in the market. That's mostly because it's travel friendly, it is very affordable and packed with features. The seat can recline to a nearly flat position, which is super convenient for nap time and changing diapers on the go. Plus the 5 point safety harness can be adjusted to several different height positions, so that you can make it fit your child as it grows. 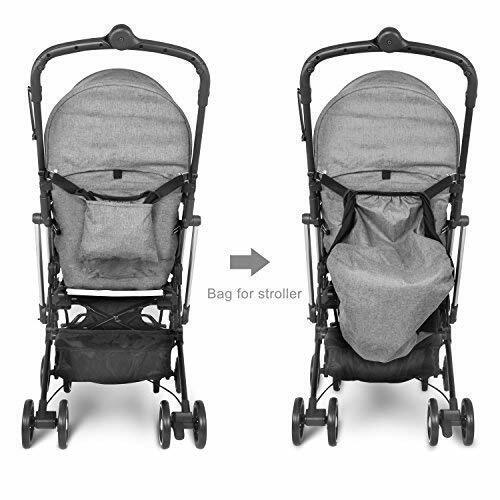 This stroller comes with a large, adjustable canopy that will protect your baby from the sun. The canopy in the photo is closed, and can be extended far beyond that point. 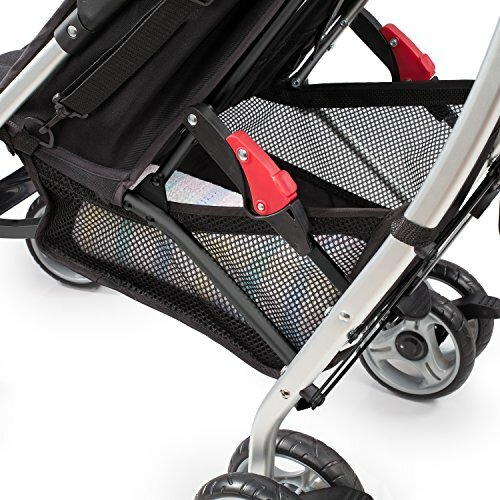 You will also have plenty of storage space in this travel stroller. There is the large basket below the seat, which can comfortably fit diaper bags and even purses. And there is also a rear storage pocket, for all necessities you need handy - keys, phone and whatnot. Well, the stroller weighs less than 20 lbs, so you shouldn't have any issues checking it at the airport. But this is one of the heaviest strollers we checked out today and that is a downside. With other brands you can get a product that is 5-6 pounds lighter, and that ultimately makes it more portable. Just one cup holder. And that means that you can use for either the baby's bottle or your own one. The stroller is a really good purchase overall, but I think it would be much better if it had just one more cup holder. The wheels aren't the best one in the market. You might have issues with them breaking or falling of, and they are just not that sturdy overall. But they are okay for a stroller you won't be using on a daily basis. The Evezo stroller is reclinable and lightweight. It's obviously collapsible, and it's a good and affordable travel stroller. Definitely not the best one out of the bunch, but maybe it is the best one in its price range. I would honestly say that the best thing about this stroller is the fun and colorful canopy. It is adjustable, and you can let your child enjoy the sun for a little while, and then completely shield them from it. 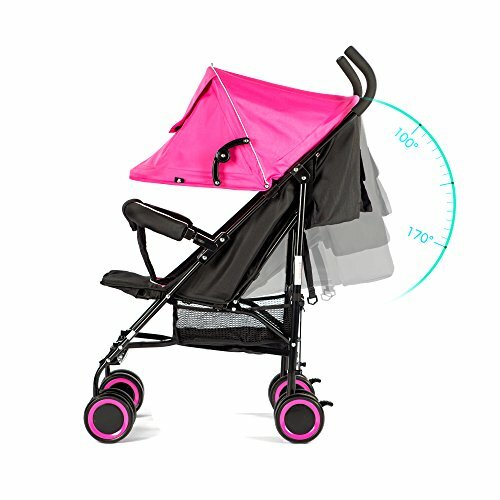 Tip: The stroller with the pink canopy is the cheapest option. Like I mentioned, the seat can be reclined from a folly upright position, to a crib-like one. So, it will be perfectly comfortable for your baby to lie in this travel stroller. As for storage space, you don't get too much, but you do get something. This stroller has a basket below the seat, which could fit an extra blanket and I'm afraid not much else. But you also get a pocket on the back, for any of your own necessities. But in terms of safety, you get plenty. Not only does the harness have a 5 point safety system, but there is also a collision bar at the front that will stop your child from accidentally falling out of the stroller. Again, when compared to other strollers, this one much heavier than most of them. The difference is that big, I mean it still conforms to airline standards. But, you are looking for the best travel stroller, and that one is going to be light like a feather. 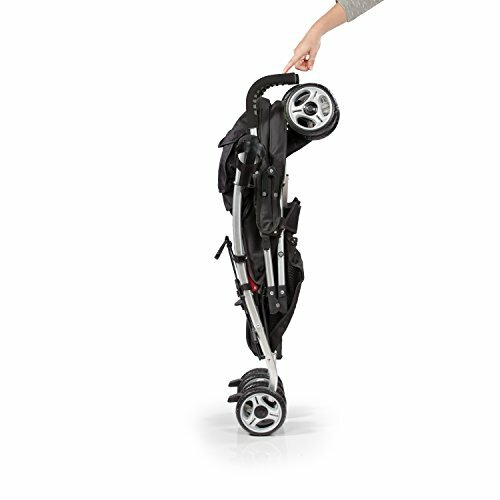 The Bersey stroller is a great travel stroller because it folds up into a tiny bag. 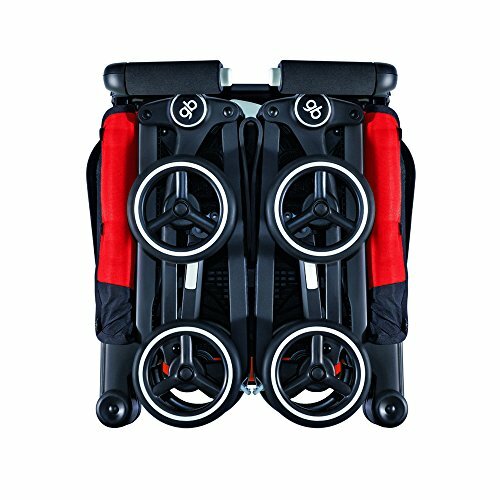 It will easily fit into an overhead, and even underseat compartment and it's probably the best choice for flying. 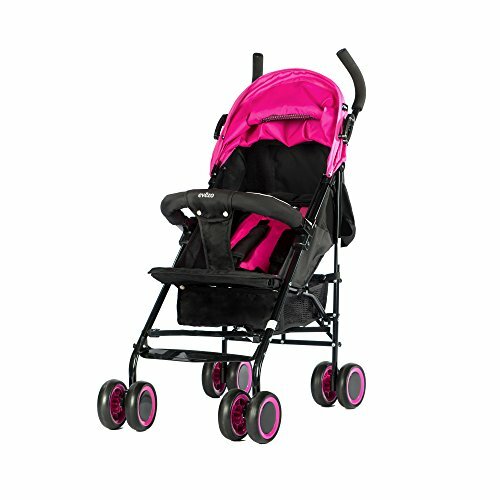 However, unlike most other strollers in this review, it's not suitable for toddlers older than 36 months. The canopy is made of high-quality fabric and it can be adjusted into several different positions. Also on the front, there's a collision handbar for your baby's safety, which can be removed if needed. The best feature of the stroller? It features a one-click folding system. You literally just press the button on the back handle, and it folds into a tiny little cube. And there is also a pocket/bag in the back that the stroller folds into, for ultimate portability. The wheels are swivel-wheels, and they can turn 360 degrees when they aren't locked. But when they are, they stay in the same position which is great for uneven terrain, and provides additional safety to your child. There's one more really cool thing about this stroller - the basket below the seat is pretty large. It can fit diaper bags and everything else you might need for your baby on the go. This is an awesome lightweight and portable stroller, but it's only suitable for infants and small babies. Toddlers can't really fit inside it, nor are they meant to. The Bersey stroller is very expensive, and it's definitely not for everyone. It is a really good product with a ton of helpful features, but unfortunately it is overpriced. Closed Dimensions: 22'' x 12''x 11"
Well that depends on a couple things - your budget and the size of your child. If you are looking for a cheap product that you don't really need to be super functional because you already have a kickass jogging stroller, then I would recommend the Evezo 2141A Recliner Lightweight Stroller. 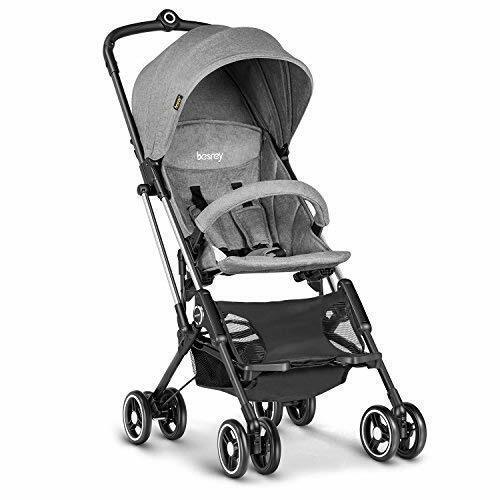 It is probably the best value for money out of the bunch, since it is equipped with a ton of useful features that you normally wouldn't expect from a travel stroller. And it's pretty affordable, so you don't really need to go out of your budget. This travel stroller can fit babies and toddlers who weigh up to 50 lbs, which pretty much means that it's suitable for all small children. The only downside? Well it's not as lightweight as it could be. But it is still under 20 lbs, which is pretty much all you need to care about. 5-point-safety-harness, front collision safety bar, and locking brakes. Mesh-net storage bin underneath the seat. Single pocket storage behind the seat. 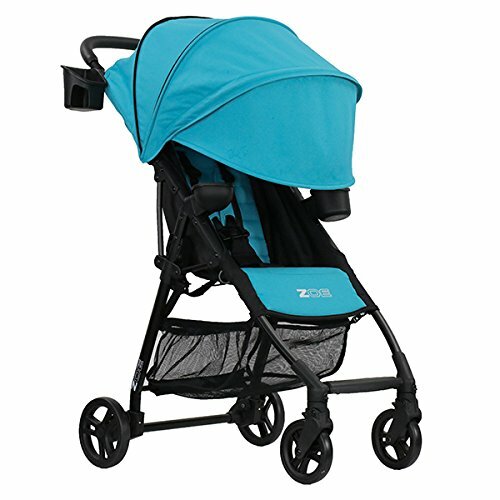 I would say that the ZOE XL1 BEST is the best mid-range stroller. It's expensive but not too expensive, and all of its cool features make the high price tag worth it. Plus you get a ton of accessories with it, so it's definitely great value for money. This travel stroller has one of the best and largest canopies out of the bunch, which is pretty important for your baby's safety. Plus it can carry up to 50lbs without a hitch, so your child won't outgrow it so quickly. And did I mention that you get plenty of storage space, for both your and your child's on the go necessities? I also really liked the Pockit travel stroller. Yes it is pretty expensive, but it’s also the only stroller that can actually fit inside your purse when folded. So, you will be able to store it in the overhead compartment of any plane without an issue. Or just in your carry on. It might not come with a ton of accessories or storage space, but that isn’t what we’re looking for anywhere. We’re looking for the best portable and convenient stroller, and the Pockit sure looks like one. And for one that can fit your baby perfectly, and this stroller will, as long as your kid isn't over the 55 lb weight limit. Those are my favorites! I really hope you found a stroller you loved. If you did, be sure to check it out on Amazon. There is always some kind of sale going on there, so you'll be able to get a pretty good deal!